A huge thank you to all who stopped by the shop the other day. Times are tough for all of us these days, so I really appreciate those who chose my creations for gifts or treats! Thank you. I must say I am incredibly jealous of Hillary, who packed her bags and left for Hawaii to go live in a sunny yellow kitchen. She was my favorite birdie too, I will miss her. I know it must sound odd for a thirty something old woman to be lamenting over the loss of her dolls, but I do. 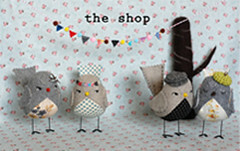 Particularly before a shop update; when I see them first thing in the morning they make me happy. My husband thinks I am so odd grinning at my dolls, cup of tea in hand. Now I must start working on my x-mas gifts. I had planned to hand make all gifts this year, yeah right. Plus my daughter turns 1 this year, my Christmas baby. How time flies. I swear you have the most beautiful packaging on earth! I am sure if I made such beautiful things I would have trouble letting them go too. I didn't realise she was a Christmas girl - go the december babies - they rock!! I love one onwards too, they start to grow into such amazing little people at that age. How exciting. You are so cute, I will take great care of Hillary! My son just turned one also. He was my Thanksgiving Baby, and I love the holiday so much more now. You should really think about making a boy doll, really! 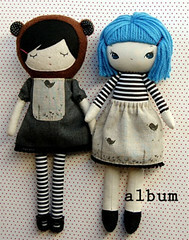 I found my way here from etsy, and I wanted to say how much I adore your dolls. I can't believe how fast they go, everytime I get to my computer they are all gone!